Figure 7.3. Increased Isp reduces transit time and weight ratio. In a nutshell, chemical propulsion is capable of large thrust but for very short times, because its propellants consumption is too high. When in 1969 Saturn V took off for its Moon mission, the thrust of its first stage was some 3,400,000 lb, or 15.4 MN, but lasted only for about 10 minutes. Most of the energy expended was not used to carry the Lunar Module and crew re-entry vehicle to orbit: it was spent in lifting the very propellants to accelerate to orbit, in other words, to lift and accelerate itself. A 130 HP motorcar traveling at 180km/h (110 mph) has a specific impulse about 21,500 s, more than 40 times better: any gasoline-powered car gets better "mileage" than any chemical rocket engine. It is for these reasons that, until recently, interplanetary missions have inevitably utilized short bursts of thrust to accelerate space probes: short accelerations limit total propellant mass. In practice, since escape speed from Earth is 11.2 km/s, maximum probe speed is in that neighborhood. Higher speeds are feasible by means of "gravitational assists", in trajectories purposely designed to swing by planets and extract kinetic energy from them. For instance, the Cassini-Huygens speed approaching its Saturn destination was about 40 km/s before slowing down to orbit. Planet swing-by is cheap, but takes a long time: trajectories may last even 10 years. Thus, so far, interplanetary missions are accomplished by accelerating probes for short times (a few minutes), followed by coasting at constant speed, not constant acceleration. This strategy saves mass, but stretches mission time to several years. So, a round-trip mission's duration will be almost the professional life of a mission ground team, and if the ship is manned, most of the professional life of a crew. Besides, at constant speed and in absence of specific remedy, a crew would live under micro-gravity condition, with irreversible health consequences, among others, for their bone structure and enzymatic functions. Moving to the edge of our planetary system, to the so called Oort cloud believed to be the birthplace of comets (see Chapter 8) would mean reaching to 50,000 AU. At constant speed, trip times to the Oort cloud would be of order 17,000 years. 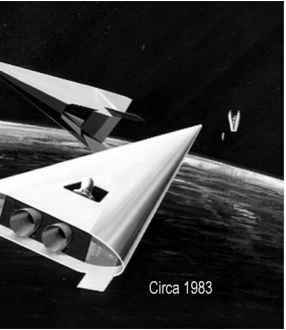 The conclusion is that the "conquest of space" is meaningless without ways of shortening space travel. Hard as it is to move in the Earth's immediate vicinity, interplanetary travel is much harder, beyond anything that can be reasonably expected of chemical propulsion. No advances can be forecast in chemical propulsion because the energy it can release per unit propellant mass consumed is limited by chemistry to not much more than 10 MJ/kg. Reasonably short interplanetary missions need reasonable initial, or even constant, acceleration. This means thrust maintained for days or weeks, not minutes. This also means large power and pro-pellant mass consumed. So, interplanetary travel awaits a dramatic change of propulsion technology: that is, power and technology capable of raising Isp by a factor 2 at the very least. Such change will automatically raise the power requirement: higher Isp means higher exhaust velocity, higher exhaust kinetic energy and its flux, i.e., higher power. In fact, power scales with velocity cubed. Doubling the Isp at fixed thrust halves propellants consumption, but also raises the power needed to accelerate and exhaust the same propellants by a factor 8. So, higher Isp must have power sources adequate to maintain that Isp and the thrust needed.